I recently told a homeowner that when it comes to a kitchen renovation in Honolulu Hawaii, the first step is to put together a design plan. She understood this was key but still wondered whether the cost of a full kitchen remodeling job was in her current budget. Unfortunately, when it comes to a kitchen remodel budget, it can be difficult to come up with a ballpark estimate without first having a detailed design that will determine exactly what type of work you will need. As a consumer though, the homeowner wants to know if they can afford the project before investing in a design plan. The first thing to do is define a few parameters. Some kitchens are quite small while others may be large. A kitchen that is 125 square feet will be used in this example. Most kitchens will average anywhere from 100 to 250 square feet. So, this number will place our example in the middle. Next, you will need to consider what level the finish will be. When it comes to kitchen remodeling Honolulu homeowners have three levels to choose from. We are also assuming that for this example the layout of the kitchen will remain the same, but renovating will correct typical electrical and plumbing issues which will bring everything up to code. The following costs are simply guidelines of what to expect when you remodel your kitchen. Every Honolulu kitchen renovation is different, but if you refer to these guidelines as you discuss the project with a contractor, you should both be on the same page when it comes to cost. Prices are displayed as entry-level/midrange/high-end. Only one price is listed if the cost stays the same for each level. A professional Honolulu Hawaii remodeling company may also charge for the company’s overhead, management, and profit. Each company is different, but the average cost for professional project management is roughly 11% of the entire project’s cost. Most companies have a profit of 8-10% while the overhead can range from 12-18%. Changing the placement of the plumbing or appliances can also add to the cost. Relocating a kitchen sink can be anywhere from $2,000 to $4,000. Moving windows can also add to the price. Each window moved could cost anywhere from $1,500 to $4,500. 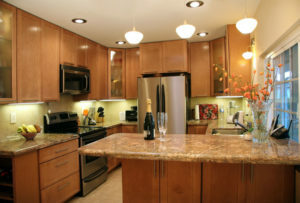 When considering kitchen remodeling, Honolulu homeowners should not take the design process lightly. Every detail needs to be spelled out in order to eliminate confusion for all involved. You can actually cut the length of time needed to complete the project by 30% with proper planning. Good design plans may even reduce cost overruns and unexpected expenses.